"This is a great marinade for different beef cuts. We use it on steaks that we want to grill. 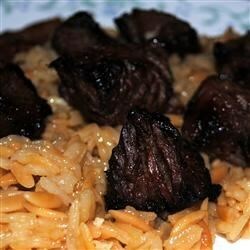 Has GREAT flavor and keeps meat tender and moist! Give time to marinate 6+ hours." This was a good marinade. I used to make beef kabobs. I replaced the orange juice with lemon juice, and the fresh ginger with dried ginger. My kids and their guests devoured it. This was pretty good... the meat came out very moist and zippy. Thanks for sharing. Will use again. Very tasty! I didn't have the fresh ginger so I used powdered and it came out just great. This is a yummy recipe, after cutting the soy sauce in half. London broil soaked for 2 days and was awesome. Thanks for sharing this quick and easy marinade. Everyone ate it up.